On Mykonos, there are plenty of hotels and room prices are among the highest in the Cyclades. 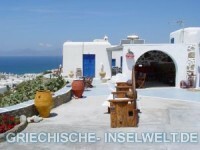 In and around Mykonos town are the most hotels and rooms, the prices are for years at a high level. Directly in the city are mostly only small hotels and inns, larger plants are a little outside. Especially in the high season Mykonos is very crowded and much booked up! The search for a cheap and good room can take some time. Prices you know from other Cyclades islands used to be just smiled. Living in the vicinity of the village has the advantage that you are not dependent on buses in the evening and can enjoy Mykonos town without time restrictions. Lump can be said, the closer the beach is at Mykonos town, the more hotels and rooms there are. Accordingly full ist the beach during the day. If you like to stay at the beach a day long and don’t spend every night in Mykonos town, you are in good hands in a hotel at the beach.